I was just watching this clip and realized that Tom Cruise knows what hes doing. Regardless of his strange behavior or beliefs, Tim Cruise loves his craft. I heard Simon Pegg say “Tom cares about the audience so much he wants to give them an authentic experience.”. 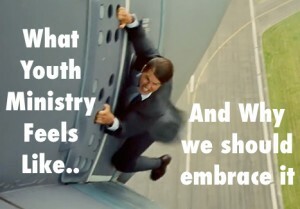 This is in reference to why Tom Cruise does his own stunts. This video sparked the question, in me, do youth pastors do their own stunts? Let me explain. Running a youth program is like doing movie stunts. We stay up late with the kids, we go on the mission trips, we go on the camping trips, we have difficult conversations with kids, parents, and staff; this is what makes life, love, and ministry authentic. No one can do it for us. We have to be engaged. Sometimes, we have have to strap ourselves to the plane, minimize the life ending dangers, and then hold on for dear life The Holy Spirit helps us endure the the barrage of negativity or being fired but He does not reduce the risk that something could go wrong because of human error. Going on a mission trip further than you have ever gone before. Sharing your faith with strangers. Taking chances with the program for the long term betterment of the students. I, and most likely you, want your kids and your youth ministry to have an authentic experience with Jesus but I believe this is predicated on the amount of faith and risk we put into our own walk with God. We cannot lead where we have not been. We have to do our own stunts. Where do find yourself, in your Christian walk, calling for a stunt double to take your place rather than doing the “stunt” yourself? How can you use “risky” acts of faith to make your youth ministry a more authentic reflection of the Gospel?